A solar water heater is reliable, cost-effective, green energy. Seattle solar specialist Northwest Mechanical will help you navigate the Federal tax credit and install this clean, environmentally friendly energy source. Domestic Hot Water (DHW) Systems use the suns energy to heat water directly which is much more efficient than creating electricity and then using that electricity to heat hot water. Current technology allows us to capture about 70% of the suns energy and use it to heat hot water where photovoltaic systems typically capture about 15-20% of the suns energy. These extremely efficient systems are typically designed by Smart Solar Solution to heat 50-75% of your annual domestic hot water needs. For example, you may get 160 degree water in the summer time, more than you can even use, whereas a cloudy winter day may only provide you with sixty to ninety degree water. This is great though because then your heating from this rather than the approximate forty-eight degree ground temperature water typically found in Northwest. • 30% federal energy tax credit based on the installed system cost. Northwest Mechanical, Inc. typically installs Apricus evacuated tube solar hot water systems, due to the cool nature of the Pacific Northwest. These slightly out perform flat plate collectors when there are clouds in the sky, or the temperatures are cold thus making them ideal for our climate. We also install flat plate collectors for large array commercial and pool heating applications. In evacuated tube systems, the sun hits the evacuated glass tube which traps the heat. Inside of this glass tube is a ¼” copper pipe with a little less than an ounce of water in it. This little bit of water boils and turns to steam that carries the heat to a manifold that runs through the top of the collector. The manifold is typically filled with part glycol to avoid any chance of freezing, or the system is designed to completely drain during freezing weather.. This solar heated fluid is then pumped down into a separate solar water tank where a heat exchange transfers the heat into the domestic water supply. Your current water tank or on demand water heater will then draw on this tank for water. If it’s too hot, it will add cold tap water to get it down to the temperature you want coming out of your faucets. If it isn’t hot enough, your existing tank will turn on and give it a boost. A Happy Solar Homeowner with his new solar DHW system, replacing the one installed by Buzz Burgett's company 35 years ago. It worked so well it was worth replacing. Solar panels in Seattle are becoming more and more popular. Go Seattle Solar! And as they should be. Solar power is an environmentally friendly, dependable and very efficient way to heat your home. But, its also an excellent way to generate hot water. 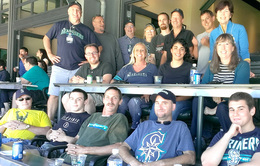 Did You Miss The Seattle Solar Tour? Did you miss the Seattle Solar Tour last weekend? If you did, don't worry! Its never too late to learn about the benefits of solar energy. Feel free to contact us to learn more! Don't miss the Seattle Solar Tour this Saturday, September 21st from 11am-2pm. NW Mechanical will host an open house - stop in and say hello! You can download the master list of tour sites and map at www.nwseed.org. 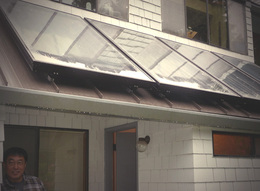 A solar water heater is reliable, cost-effective, green energy. We'll help you navigate the Federal tax credit and install this clean, environmentally friendly energy source.